Lincoln Castle today is one of the main attractions in the British province of Lincolnshire. This picturesque castle is visited by thousands of tourists from around the world. The beauty of it now recalls nothing of its dark past; when for centuries it was used as a prison where they found hundreds of dead people. The fortified building was erected in the early 11th century by the legendary - William the Conqueror, who used long stone walls for his home. Before the ruler was to arrive in the southern territory of the British Kingdom, he erected massive fortresses in Warwick, Nottingham and York. At that time Lincoln was one of the largest cities in the country and was an important commercial center with a population between 6000 and 8000 people. Once arrived in Lincoln, William the Conqueror found the remains of a Roman fortress, which was located 60 meters south above the village. That position seemed to him ideal for the construction of the new fortress. The new Castle proved to be the crossroads of important trade routes throughout the British territory. 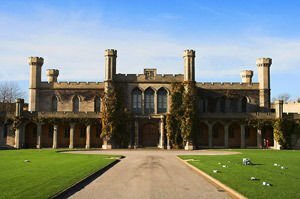 Subsequently, during the beginning of 1787 Lincoln Castle was a prison for the Lincolnshire area. One reason the palace was used as a prison was because of its successful placement, practical exhibition and the building makes it impossible for detainees to escape. The prison operated for nearly ninety years to 1878. Today the castle Lincoln has become an interesting historical museum which offers a lot to see and learn. Walk around the ancient walls of the castle and you will find the unique view of the beautiful cathedral in the city. One of the priceless treasures that are kept in the exhibitions in the castle Lincoln is one of four surviving originals of the Magna Carta sealed by King John back in 1215. This document is accompanied by a detailed exhibition explaining the origin and ultimately the consequences of him. As a museum, today you can see some of the functions of the rooms of the palace, which were used as a jail. Quite intriguing to see is one of its kind in the world - the preserved chapel, which is made by a splitting system - each seat is separate and isolated from the others.